Eosinophilic esophagitis, or EoE, is a condition typically caused by food allergies. (It is sometimes referred to as eosinophilic gastrointestinal disorders or EGIDs). Eosinophilic esophagitis causes inflammation of the esophagus due to a build-up of eosinophils, a type of blood cell. Symptoms can be painful, and may include trouble swallowing, nausea, regurgitation, heartburn, abdominal or chest pain and weight loss. Read on to learn more about EoE and how Neocate can help. Eosinophilic Esophagitis (EoE) is more common in boys: close to 3 out of every 4 children with EoE are male. This condition can be diagnosed at any age (adults can have food allergies and related conditions as well). Unlike other food allergies, which may be outgrown, EoE is thought of as a chronic condition, meaning it will never fully go away once a person develops it. Eosinophilic Esophagitis is not as common as some other allergic disorders. Recent estimates are that Eosinophilic Esophagitis affects about 5 or 6 of every 10,000 people in the US. The exact number is hard to figure out and this could be on the low end, because awareness and recognition of EoE are increasing. Eosinophilic gastroenteritis is a condition when inflammation due to food allergies happens in the GI tract (stomach and small intestine specifically). Eosinophilic colitis is a condition when inflammation due to food allergies happens in the colon (large intestine). Like many food allergies and related disorders, doctors aren’t sure of the exact cause of EoE, or why some people develop EoE while others do not. Many people with EoE also have other allergic diseases such as hay fever, asthma and food allergies. A child’s body has a number of tools to fight off infection. One of these tools is a type of white blood cell called an eosinophil. In EoE, food allergens can cause large numbers of eosinophils to move into the esophagus, where they do not belong. Hence the name - eosinophilic esophagitis. Researchers are working to better understand factors that may cause eosinophils to move to the esophagus. Once someone has EoE, the cause of the symptoms is simple: exposure to the offending foods! The most common food allergen in EoE is milk protein, and most EoE patients are allergic to 2 or more foods. Children and adults can experience different EoE symptoms. For teenagers and adults with EoE, chest pain and trouble swallowing foods can be especially troublesome. EoE is a complex condition, and that can make it a challenge to get an accurate diagnosis. EoE is often mistaken for Gastroesophageal Reflux (GER) because of some similar symptoms. Most children with eosinophilic esophagitis have multiple food allergies, including milk and soy. Diagnosis of EoE is made by endoscopy and biopsy. An endoscopy is a medical procedure that allows your doctor to look inside the digestive tract. A thin, flexible, lighted tube called an endoscope is guided into the mouth and throat, then into the esophagus, stomach and duodenum (beginning of the small intestine). The endoscope allows your doctor to view the inside of this area of the body, as well as to insert instruments through a scope for the removal of a sample of tissue for biopsy. The biopsy is reviewed under a microscope by your doctor to look for inflammation by counting the number of eosinophils. Blood tests: Some tests use a patient's blood to see if a food is likely to cause an allergic reaction. Atopy patch test: A small amount of potential food allergens is placed against the skin for several days, then observed for reactions. Skin prick test: The skin is pricked to introduce a small amount of the potential antigen under the skin (in close contact with the immune system). Trial food elimination: Suspected foods are removed from the diet to see if signs and symptoms of food allergy improve or resolve. Unlike other food allergies, the only certain way to know if a food is a trigger for EoE is through resolution of symptoms and a decrease in the eosinophils in the esophagus with elimination of the food. This is called an elimination diet, and you can read more about it below. When a trigger food is reintroduced to the diet after the elimination period, symptoms recur and the number of eosinophils in the esophagus rise. There is currently no cure for EoE, but there are several ways to manage the disease, alone or in combination. Talk with your healthcare team about which may work well for you. Managing EoE through diet can be an effective option to alleviate symptoms and prevent further damage to the esophagus. The use of nutrition management in EoE can uncover which specific foods are triggering EoE and remove them. It involves avoiding food allergens, and there are several possible approaches to consider. Amino acid-based, or elemental, diet: All sources of whole proteins are removed from the diet. This involves use of an amino acid-based product (such as Neocate). Neocate has neither whole nor fragmented protein chains that can trigger an allergic response. Simple sugars, salt and oils may be permitted (100% apple juice, apples, white grape juice and sugar). 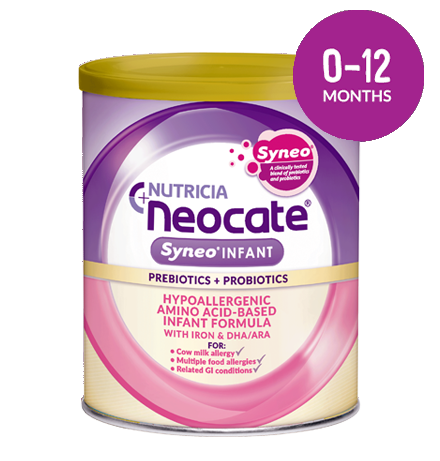 Formulas such as Neocate may be given either by mouth or tube feeding depending on your child’s nutritional needs. Neocate Nutra is a semi-solid that can be used to supplement the diet. In general, amino acid-based diets are successful in resolving symptoms and lowering eosinophils in the esophagus for about 95% of children. Elimination diet: This approach may remove common food allergens (such as the Six Food Elimination Diet) or it might remove foods based on positive allergy tests seen in children. In general, elimination diets are successful in resolving symptoms and lowering eosinophils in the esophagus for about 75% of children. If your child responds to an amino acid-based or elimination diet with improvement of symptoms and/or a decrease in eosinophils in the esophagus when checked on follow-up endoscopy, the next step would be food reintroduction using food trials that involve adding back one food at a time to determine which specific foods are causing a reaction. Adding one food at a time for a period of weeks, monitoring for symptoms, and keeping track of foods introduced will help you determine which food(s) may be causing the inflammation. This process takes time. In a child that was on an amino acid-based formula only, it may take months for him to return to a healthy diet. An amino acid-based formula helps ensure that the nutritional needs (vitamins, minerals and calories) of your child are being met. This will be important to help support normal growth and development during this critical time. 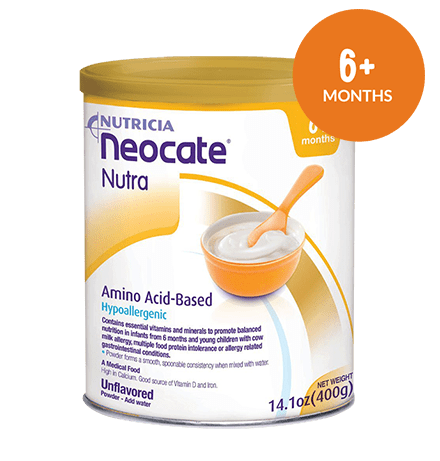 Combination of the two: Amino acid-based products (Neocate Syneo Infant, Neocate Nutra, Neocate Junior, Neocate Splash) can be used to supplement an elimination diet for EoE. Adding Neocate to an elimination diet can help to meet 100% of nutritional needs. Steroids can be successful in resolving symptoms and reducing the number of eosinophils for EoE. Unlike dietary management, medications will not uncover which foods trigger EoE. While medication can improve symptoms, they can reoccur once medications are stopped if the foods that cause the symptoms are still being consumed. There are several ways that steroids can be used. Systemic steroids: These are steroids that spread throughout the body. They are often only used short-term and may be reserved for patients with severe symptoms. This type of steroid can have side effects, especially with long-term use. Topical, or swallowed, steroids: This approach involves swallowing a small amount of steroid that's targeted at the esophagus. The steroid is often thickened, such as with Neocate Nutra or other powders or thick liquids. Dilation is often reserved for adults. It involves using a device that expands like a balloon to enlarge the diameter of the esophagus. Neocate offers a variety of products that can be helpful for young and older children and adults with EoE. 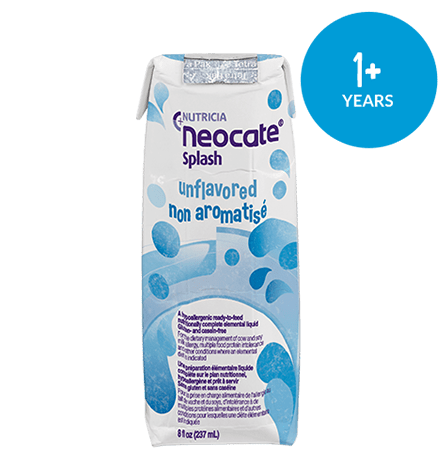 Ask your healthcare professional about Neocate Splash, which provides balanced nutrition your child needs in a variety of tasty flavors and in convenient ready-to-go drink boxes. 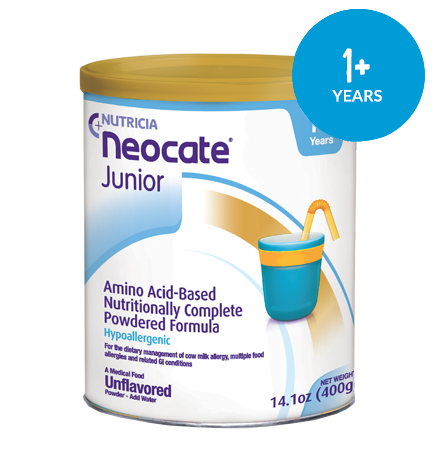 Neocate Nutra can also be used to supplement the diet of children with EoE experiencing feeding difficulties. Because of its spoonable consistency, it is a great tool for adding texture and variety into the diet. More information on EoE can be found in our EoE parent guide. Nutritional therapy must be under the direction and supervision of a health care professional. Watch the Gus the Esophagus video to learn more about EoE. APFED, the American Partnership for Eosinophilic Disorders, is a non-profit organization dedicated to patients and their families coping with eosinophilic disorders, including EoE. APFED strives to expand education, create awareness, and support research while promoting advocacy among its members. CURED, Campaign Urging Research for Eosinophilic Diseases, is a not for profit foundation dedicated to those suffering from eosinophilic enteropathy, which includes eosinophlic esophagitis, eosinophilic gastroenteritis, eosinophilic colitis and other eosinophilic disorders. Food Allergy Research & Education (FARE) is a nonprofit organization that was formed in 2012 as the result of a merger between the Food Allergy & Anaphylaxis Network (FAAN) and the Food Allergy Initiative (FAI). FARE works on behalf of the 15 million Americans with food allergies, including all those at risk for life-threatening anaphylaxis. Kids with Food Allergies is a go-to resource as well. They offer daily assistance and practical food allergy management help and have a large online peer support group focused solely on children’s food allergies. Registration is free and a good place for giving and getting help with food ideas, recipes and cooking challenges! It's not unusual for people with EoE to have feeding tubes. Two great resources for "tubies" are the Feeding Tube Awareness Foundation and The Oley Foundation. The first and only hypoallergenic formula with prebiotics and probiotics, specifically designed for food-allergic infants. The first and only ready-to-feed hypoallergenic formula designed to address the growing nutritional and lifestyle needs of toddlers, older children and teens. Available in: Unflavored, Orange-Pineapple, Grape, and Tropical. 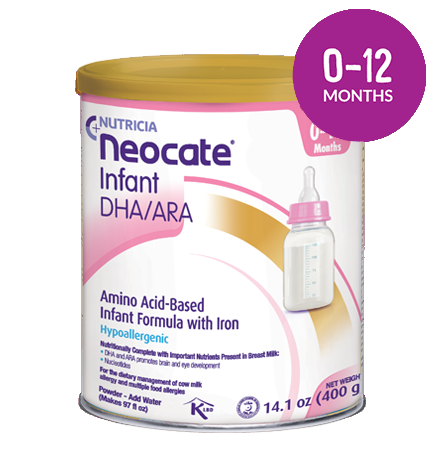 Neocate® Infant is the original hypoallergenic amino acid-based formula, designed for food-allergic infants. The first and only hypoallergenic, amino acid-based, solid food. Pudding style consistency, ideal for spoon feeding. The only hypoallergenic formula that is available with or without prebiotic fiber to help support digestive health and specifically designed to address the growing nutritional and lifestyle needs of toddlers and older children. Available in: Unflavored, Vanilla, Strawberry, Chocolate and Tropical.